Nomadic or semi-nomadic populations often struggle when hemmed into refugee camps. They are used to having a lot of space and being mobile, and they typically travel with a lot of animals, which comprise both their assets and livelihoods. Yet camp boundaries are necessary to determine who is receiving assistance and to ensure aid meets humanitarian standards. But aid agencies are increasingly tasked with not only protecting refugees’ lives but also their ability to recover from crisis, and accommodating pastoralists’ livestock is often the best way to do this. The mass exodus of pastoralist populations from northern Mali during the 2012 conflict has spurred aid groups to explore new approaches to helping both people and their animals. 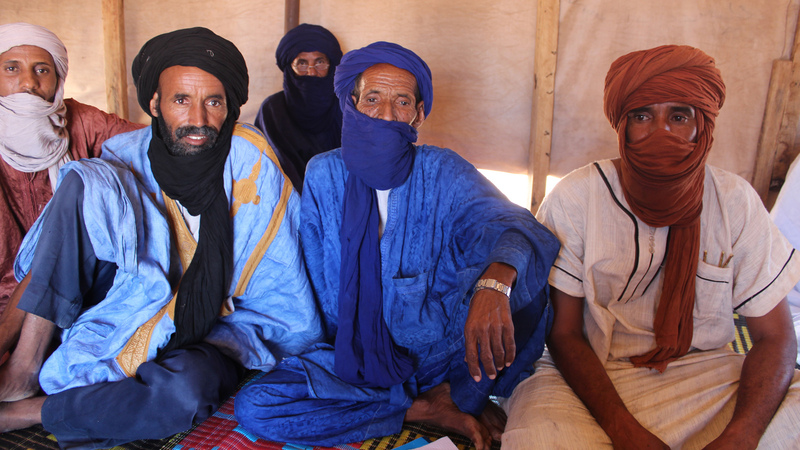 IRIN spoke to UN Refugee Agency (UNHCR) teams in Niger and Mauritania about how they help these nomadic refugees. In the Mbera camp in Mauritania, an estimated 68,000 Malian refugees are spread across 350 hectares which, though not at all cramped, is too confined for many of the families, who say they are not used to being so close to their neighbours. Some face their tents away from their neighbours; others live at the camp’s edges, where they feel a little more alone. Camp residents are creatively adapting to the confines of camp life. While the World Food Programme (WFP) is distributing its usual rations - pulses, cereals and oil rather than the milk and meat that northern Malians are used to - the refugees have started their own fledgling dairies and are operating an abattoir with help from the NGO Action against Hunger (ACF). “Abattoirs and dairies are not our skill,” WFP’s Mauritania interim head Moise Ballo said drily, but the organization is looking into whether cash distributions would work in the camp and whether people would be able to buy what they wanted with them. UNHCR, recognizing the potential complications of running a hygienic meat-and-milk supply chain, says it is willing to vaccinate and de-worm animals to reduce the risk of disease. Some 14 dairies are currently running, distributing milk to families who have none. “Milk is indispensable for us. If we don’t have it, we will get sick,” said herder Aitaa Ag Mahmoud, describing an illness he called ‘takagress’ in the local Tamashek language. “Without milk, we get fever, we have no energy, we have diarrhoea, you can even vomit,” he said, as other herders around him nodded. Families with no animals usually sell part of their food ration - usually the beans - to buy meat, milk, condiments, charcoal or soap, all of which are sold at inflated prices. There are not many animals in the camp, but most families have a relative or, for the well-to-do, a helper, herding their animals nearby along grazing routes in Mauritania and Mali. The few animals in the camp require regular water, but there are inadequate water points in eastern Mauritania, and many that do exist need rehabilitating. Pasture is scarce this year as the area received poor rains. Oxfam has built two water troughs for animals a couple hundred metres from the camp, which are connected to the camp’s overall water system. When IRIN visited, at least 300 cows, goats and sheep were waiting their turn to drink. Water was running low in the trough, which was designed for sheep and goats, causing anger. “The owner keeps on shutting the water off, so we have to wait for hours,” said herder Mohamed Dirja Dadir Mohamed. Most said they appreciated the water, but that they needed many more troughs between the camp and Mali. Putting just one or two water points around the camp encourages animals to stay in one place, and thus over-graze, warned German NGO SPANA, which has advised UNHCR to instead support the creation of water points along traditional grazing routes. Hovig Etyemezian, UNCHR’s head in Bassikounou, the hub for agencies working in Mbera, is receptive. Etyemezian noted that UNHCR has moved on from its emergency phase, when it focused on covering refugees’ basic needs, and is now addressing quality-of-life issues: how to help refugees generate income, how to improve schools, and how to meet animals’ needs. Etyemezian is collecting information on where animals’ water points should be built or rehabilitated. “We have to serve our refugee population’s needs, so if they’re cattle-owners, we need to address that,” Etyemezian told IRIN. Local NGO SOS Desert has been trying to help herders by distributing fodder to milk-producing animals, vaccinating and deworming them, rehabilitating a dozen pastoralist wells around the camp, and trying to set up market gardens, among other activities, “just so people didn’t lose hope”, said the organization’s Mbera head, Ahmed Ibrahim. Helping host populations will also promote harmony, he said. But these activities have reached just 2-5 percent of animals in the camp, he estimated. UNCHR’s efforts to make the camp appropriate for pastoralists requires being sensitive to their need to move for pasture and vigilant about communicating security conditions to those who do. The agency is working with the UN Stabilization Mission in Mali and others to designate green, orange and red security zones in Mali. Thus far, about 1,000 camp residents have officially voluntarily returned to Mali from Mbera, but most pastoralists IRIN spoke to said conditions were still too insecure. They feared being ethnically profiled as militants and worried about the theft of their livestock. But herders say their animals still lack vaccines and food. Herders in Mbera refugee camp in eastern Mauritania, Octobeer 2013. Pastoralist Mohamed Ag Adnana, who comes from the Timbuktu region, said that of 300 livestock belonging to refugees that recently crossed into Mali, most had been captured by farmers. Other herders agreed, but agencies IRIN spoke to were unable to confirm the figures. Adnana described an alleged attack on a herder on 24 October, in which 28 animals were stolen. “The security conditions are still not good for returns,” agreed Etyemezian, who said that for this reason UNHCR is not yet giving return packages. Instead, it offers security briefings to those who declare an intention to return, and informs UNHCR colleagues and security forces on the Mali side of the border so they can offer help. But herder Mohamed Ag Mahmoud told IRIN that a group of herders who recently tried to cross the border with their refugee cards were forced to pay US$4 each to the Malian border officials. “And this was after hours of negotiation,” he said, angrily. In Niger in 2012, when the first wave of Malian refugees arrived in the Tillaberi region, between the capital Niamey and the Mali border, UNHCR tried similar methods to accommodate them in a traditional camp. But when a second wave arrived further north, in Intikane, in the Tahoua region, accompanied by hundreds of animals, UNHCR decided to try a different approach. The area, near a militant-held zone in Mali, posed a protection risk, and the number of animals arriving seemed too great for a camp setting. UNHCR asked the government for a grazing space further from the border, and the government put the agency in contact with an ethnic Arab Tuareg community in Intikane. They struck a deal: the community would welcome the refugees if UNHCR rehabilitated their 700-metre well. Soon after, UNHCR transported some 9,000 refugees and thousands of sheep, goats, donkeys, cows and camels to the 500sqkm area. The animals were vaccinated on arrival so they would not spread diseases to the host population’s herds. Families were given tents made of traditional materials and were told they could settle where they wanted. With so much land to cover, many settled far from water points, so UNHCR gave them donkeys and container trucks to transport water, as they had done in Mali. Rather than calling Intikane a camp, they called it a ‘Zone d’Accueil’. UNHCR has not yet collected best practice on how to address nomadic populations. “We were entering uncharted territory as far as written guidance is concerned… When you look at UNHCR guidelines or Sphere standards, there is no blueprint for how to cater to refugees in such an environment - they have minimum standards for human water consumption but not for animals,” said Karl Steinacker, UNHCR head in Niger. The Intikane approach has had significant livelihoods benefits: assessments have shown that just 11 percent of residents rely on WFP rations as their principal source of income, compared to half of the residents in Niger’s more traditional Abala camp. This indicates that being able to rear and sell their livestock has helped them maintain independence and retain their way of life, said Steinacker. But there have been trade-offs. With UNHCR working over such a vast distance, it has been difficult to ensure access to schools, health centres and water points. “Quality control is much harder with so much space. We can’t control access to everyone logistically,” Steinacker said. Operating costs are also high for the number of refugees. High malnutrition rates in this and other Niger camps have persisted, despite blanket feeding for all children under five, said Steinacker. Agencies are struggling to address the problem, citing large numbers of children per caretaker and low education rates among women as contributing factors. Aware of deep-rooted social hierarchies among high- and low-caste Tuaregs, Arabs and black Malians, UNHCR is trying to better understand the social stratifications among the refugee population to ensure equal access to services. Many of Intikane’s residents, for instance, are lower-caste Tuaregs, which contributes to low school attendance rates as the children are often busy taking care of other families’ animals. A second Zone d’Accueil is being set up further north in Tessalit, near the Algeria border. Some 1,300 Malians have arrived in the area in recent months, fleeing ongoing violence in Mali’s northern Kidal region. The zone will operate along the same lines; UNHCR struck a deal with the pastoralist hosts, who will accommodate the refugees in exchange for the repair of their water system.